Let me ask you this . . . where would you rather be right now? It started down under and now the KTM Factory has taken up the mantle, with the inaugural KTM European Adventure Rally to be held in Italy from July 6-8, 2017. Sound like where you’d rather be? Then we can help you get there. Open to Orange Adventure Riders only, the Rally is tailored to suit all rider abilities, from first year Adventure riders up to seasoned Adventure pros. Designed with the V-TWIN KTM Adventure range in mind, as well as the variety of rider abilities, the route will offer 3 options for riders to tackle daily: Level 1 100% Road, Level 2 50/50 Road and Dirt and Level 3 100% Dirt. Offering riders 3-days of amazing riding in the mountainous Bardonecchia region, support is also offered in the form of lead riders, course markers and GPS files, tire support, medic and tech support, and backup vehicle and sweep support. There will be KTM Rider Goody Bags, an event photographer and special KTM guests to ride with! Limited to 150 entrants – the event is actually already BOOKED OUT! The event may be booked out already – – but not for special Australian and New Zealand guests. The chance of a lifetime to take part in the inaugural KTM European Adventure Rally can be yours – as part of the Pinnacles Passes Tour. 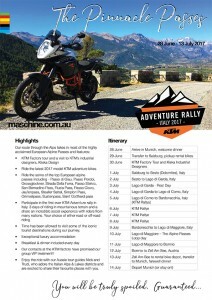 Run by the dynamic tour operators maschine, this 16-Day European Adventure will not only take in the inaugural European Adventure Rally, but also a KTM Factory tour in Mattighofen and some of the top European alpine passes, all while enjoying luxury accommodation and the stunning scenery from the saddle of a new 2017 KTM Adventure bike. Email us direct on info@ktm.com.au!